Our library is hosting the three authors of the forthcoming Curiosities: A Collection of Short Stories, which I reviewed here (and also shared a fun story about reading a couple of the stories to some juvenile delinquents here). But I hadn’t read any of the novels written by Tessa Gratton, Maggie Stiefvater, or Brenna Yovanoff and wanted to correct that before the visit. I sampled each of them by reading one of their novels, and wanted to share a taste with these mini-reviews. Her short stories stood out from the collection. Tessa has a way with language that is beautiful and evocative. But if I were to judge her novel-writing skills by Blood Magic, a witchy tale set in contemporary Missouri, I’d advise her to stick to shorter works. This is partially a matter of taste. I dislike alternating first-person narratives. This didn’t stop me from enjoying Legend, but the witches and magic story of Blood Magic didn’t seem to require both perspectives, and certainly not alternating at a dizzying rate of once every page and a half. The types of turns of phrase I found so delightful in the short story form felt forced and unnatural in a novel-length first person narrative from the perspective of teenager. Plus, I wasn’t surprised by the plot. I can see how this would appeal to a certain type of reader, particularly one who really likes magic and witchcraft and isn’t annoyed by insta-love. Though I’m not squeamish about blood (my favorite television show is Dexter) I’d advise those who are to steer clear. There’s a reason it’s called blood magic, and it involves a lot of spilling of one’s own and even an occasional rabbit murder. I might be convinced to read the forthcoming companion, The Blood Keeper, only because it is set so close to home and I like series that aren’t straight continuations but expand on other characters in the same world (like Kristin Cashore’s Graceling Realm series). Still, I am more interested in the Songs of New Asgard series, which sounds like a YA American Gods type alternative history of the US. Or maybe I’m just being hopeful. 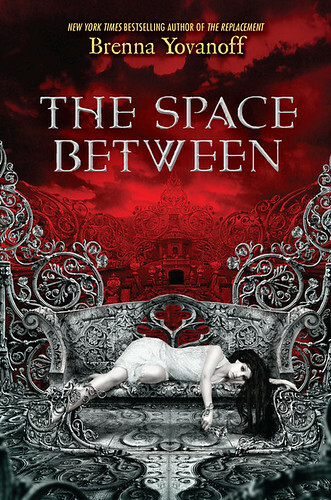 Though The Replacement sounds like a deliciously dark horror story and I’m sure I’ll eventually read it, I was more anxious to read The Space Between because of it’s gorgeous cover and my prediliction for angel and demon stories. Daphne, the daughter of Lilith and Lucifer, lives in Pandemonium, a city in hell. The description of her home, with the furnace and the metal and Lilith’s garden was a beautiful fantasy world (and the inspiration for the beautiful cover, I’m sure). When Daphne’s brother Obie decides to move to Earth permanently to be with a woman he has fallen in love with, despite the fact that the archangel Azarel hunts and kills demons who live on Earth, Daphne is distraught and goes to find him. From there, we are all but promised she’ll fall in love as well. The plot was a bit thin and the twists not all that exciting. Not a whole lot happened, and the explanation for what did was not always supported. Truman, the love interest, needed more of flushing out, and his “inner demons” needed more development. There wasn’t enough time for me to grow attached to Obie, so the quest to find him wasn’t all that exciting. I am generally a fan of Catholic mysticism in literature, but the elements that were used didn’t seem crucial to the story. I’ve said lots of negative things about the book, and really, am not sure that one star separating it from my gushing review of Daughter of Smoke and Bone conveys the difference in the books. But ultimately, I think this is a paranormal romance that a lot of teens will enjoy, and was engrossing enough that I read it in a single day (granted, I spent the day waiting in the hospital while my mother had surgery). Brenna’s prose isn’t the caliber of Laini Taylor’s, but it does have a quiet beauty about it. The story was certainly superior to other popular YA angel series I’ve read, like Becca Fitzpatrick’s Hush, Hush, which I vehemently disliked. Certain concepts that I found really compelling are what bumped it up to a 3 star for me, despite the problems I had with the plot. I loved the way Daphne’s sisters fed on the despair of humans, and I liked the idea of “the in between places” and wished both of these would have been more developed. I’m certainly going to check out Brenna’s next release, Paper Valentine, a ghost/serial killer story! One thing I do appreciate about Brenna is that she writes stand alone novels in a time when virtually all paranormal romances/fantasy/sci-fi in YA is at least a trilogy. (Also, like all the Merry Sisters of Fate, she writes great kisses). I had the most choices when I went to select one of Maggie’s books. She has two faerie stories, Ballad and Lament, The popular Wolves of Mercy Falls werewolf triology, and last year’s Printz honor book, The Scorpio Races, which is what I ultimately chose. I wanted a stand alone novel, and though I can see me checking out the faerie books some day, I’m just uncomfortable with werewolf romances. That might seem hypocrytical since fallen angels and vampires give me no pause, but something about shapeshifters freaks me out. It’s a personal thing. Maggie’s imagination is splendid. It’s hard to explain why someone should read The Scorpio Races, especially when the idea of “killer water horses” causes most to raise a skeptical eyebrow. But the prose in this is book is magical, the setting is fantastical, and though I still am not in love with the alternating POVs, I couldn’t help but get caught up in the story. I’m impressed with the writing of all three of the Merry Sisters of Fate, and very excited to meet them later this month. Stay tuned for my thoughts on the upcoming event! Have you read any of the many novels written by these three authors? Which are your favorites? I haven’t read any of these books, but I recently discovered The Scorpio Races. The synopsis hooked me, so now I’m keeping note of it. It’s also nice to spot a promising stand-alone book when I’ve been plunging into so many series lately, too.